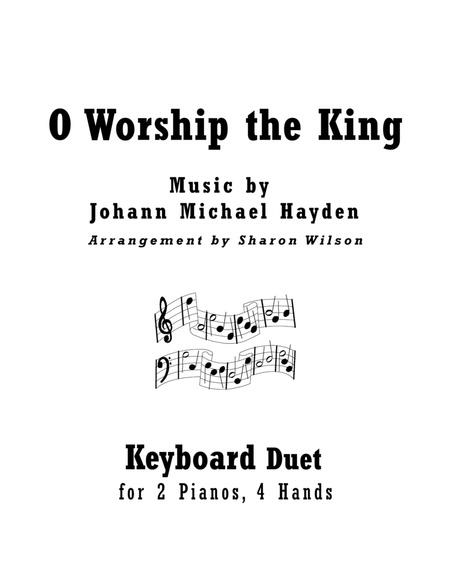 Composed by Johann Michael Hayden. Arranged by Sharon Wilson. Classical Period, Baroque Period, Christian, Sacred. Score, Set of Parts. 16 pages. Published by Sharon Wilson (S0.31631). 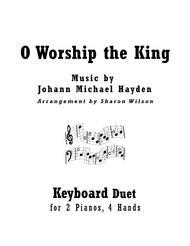 Inspired by Bach and Vivaldi, this dual keyboard arrangement weaves a classical sound throughout the familiar hymn tune LYONS. Neither part is overly difficult, yet fun to play as the piece creates a complex intertwining of patterns reminiscent of classical works. The melody alternates between the parts making each part equally enjoyable to play. This energetic arrangement will inspire the listeners whether used as a processional, prelude, or postlude. When played at a moderate tempo the piece will take just over 2 minutes to perform, however, it is easy to lengthen the piece by repeating one or more of the sections. The purchase price includes the 7 page combined score (reproducible for the second piano) as well as the individual parts on separate pages (4 pages each) .